It is coupled with a Scriptural declaration taken from Joshua 3:5 (ESV) exhorting the nation of Israel to, “Consecrate yourselves, for tomorrow the LORD will do wonders among you." One key to attaining this to fruition is to consecrate our lives to see God’s greater things. The person in the image that represents each one of us is shouting from the mountaintop this declaration. Thus, we are but echoing what Jesus told His people would do, “Truly, truly, I say to you, whoever believes in me will also do the works that I do; and greater works than these will he do, because I am going to the Father” (John 14:12 ESV). 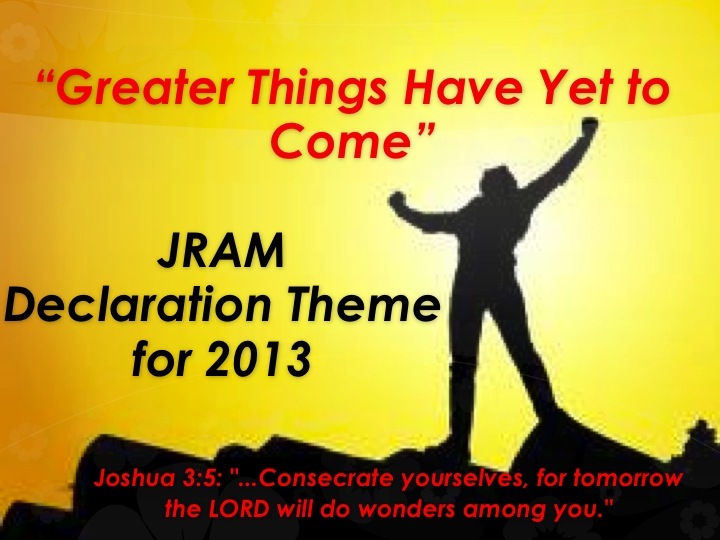 We believe therefore we speak that 2013 would be a year for “Greater Things Yet to Come.” Get ready JRAM congregations…..